The Pizza Files: The Pizza Files Summer Binge 2010.. The Pizza Files Summer Binge 2010.. The second annual Pizza Files Summer Binge is nearly hear, this years binge will start May 27th and end on August 12th. 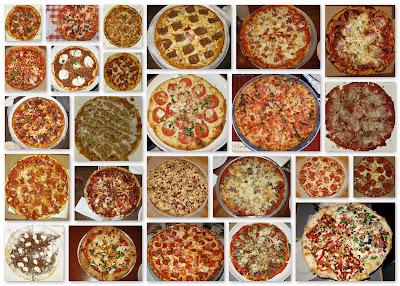 Last year I had a modest plan to hit eight local pizza joints and find a few while on a road trip out west, in the end I had 25 different pie's (see photo above) from 17 different pizza joints. I have a similar plan for the 2010 Binge, I would like to visit at least 10 local pizza joints and try to find a few during my travels. The list that follows is but a suggestion and are in no particular order other than places I have yet to visit and places I have visited. The Binge will start promptly at Noon on Thursday May 27th, where it will end I'm not sure, but it will end, at Noon on August 12th in fact. Be there or Be hungry. Pizza? We don't need no stinking _____, oh, yes WE DO! Ah the rites of summer. The beginning of the Binge. Man! It won't be long, get ready. That inspires me to go on a Starbucks binge. Of course, there won't be much variety. Then again, that's the idea behind a chain, isn't it? check out all the pizza boxes stacked up in the photo! By the way I just finished round One of the Binge 2010, well I didn't actually finish it as I have a few slices for supper.. Maybe by the middle of August I will have a collection of pizza boxes 29 high also. Gotta try the Spinjuine (A silky Italian bread dough topped with mozzarella, provolone, a special seasoned tomato meat sauce prepared with sausage, choice ground steak, sauteed onions, fresh basil & fresh mozzarella) @ Caito's here in the "field". The dude and I are game, are you? I'm there, you just let me know when.